The project is the result of a partnership with the Cafritz Foundation and will be a three-level, 75,000-square-foot structure located in the Fort Totten community. The exhibition will feature a new immersive narrative with uniquely interactive art experiences. Meow Wolf will reveal more details about plans for D.C. in 2019. Grand opening will be in 2022. 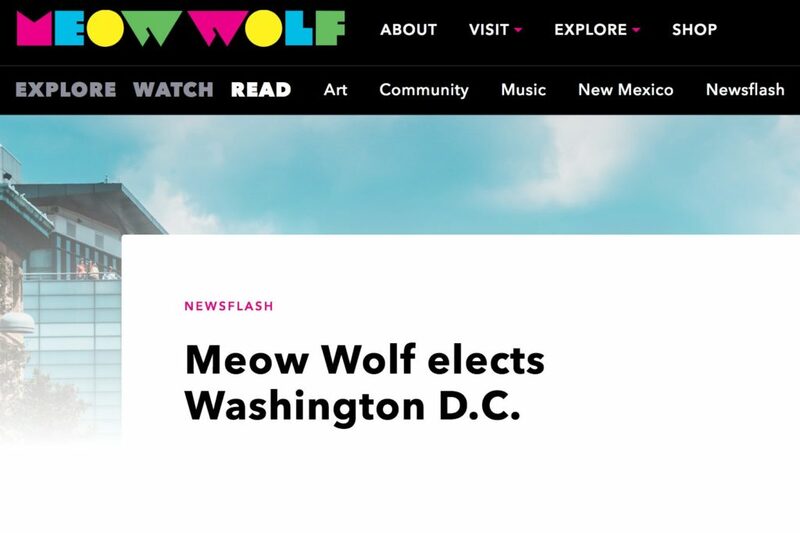 “Washington, D.C. is an international cultural powerhouse and an ideal setting for the evolving Meow Wolf story universe that began with House Of Eternal Return,” says CEO Vince Kadlubek. “Our intergalactic, transmedia story is rooted in a community of underdogs who overcome ‘The Powers That Be,’ and we will have something really special for all the fellow underdogs who seek a transformative experience when we unveil the D.C. chapter.” Meow Wolf credits the Cafritz Foundation for taking that chapter from possibility to reality. The Morris and Gwendolyn Cafritz Foundation is the largest private, independent, local foundation dedicated exclusively to the Washington, D.C. metropolitan area. The Foundation is the legacy of Morris Cafritz-one of Washington’s leading commercial and residential builders from the early 1920s to the mid-60s-and is committed to improving the quality of life for residents of the area. Since 1970, the Cafritz Foundation has granted awards totaling more than $447 million. In just the last 10 years, $185 million has been awarded to more than 961 organizations supporting Community Services, Arts & Humanities, Education, Health and the Environment. Holy Awesome – A Little Free Record Library.